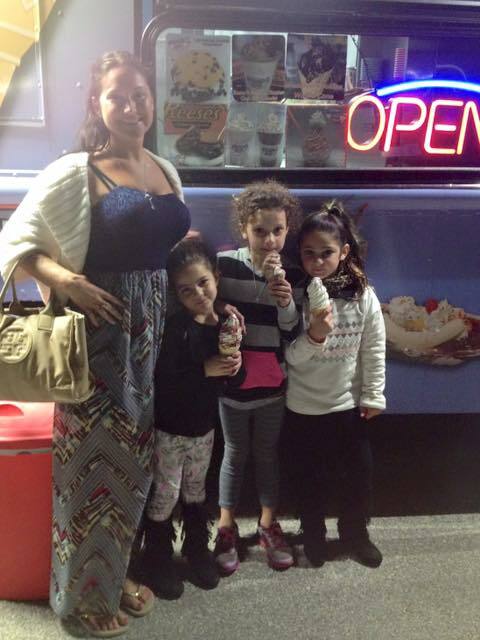 I attended the Food Truck Invasion at Carlin Park in Jupiter last night. I took my daughter and we met up with her step mom CC and little brother Jacob, our friends Jenna and John and their two daughters Riley and Gabby, and Jenna's parents. We had such a great time enjoying the live music watching the girls dance around, letting the girls play on the playground at night, and of course the FOOD! There is a vast array of different food to choose from! The little girls all ordered hot dogs and had soft serve ice cream cones from Ice Cream Express Truck. I went the more gourmet route with Boursin Cheese Balls from The Buggy Bistro Truck (let's say AMAZING) and the lobster roll from The Lobsta Guy Truck (DELECTABLE). Jenna had the fried rice from Rollin Asian truck and the doughnuts from DoughDough Donuts and said it was so scrumptious. We all had such a wonderful time eating delicious creations from the food truck vendors and enjoying the cool weather at beautiful Carlin Park. This event takes place every second and fourth Wednesday evening of the month. I highly recommend you attend this event with family and friends!